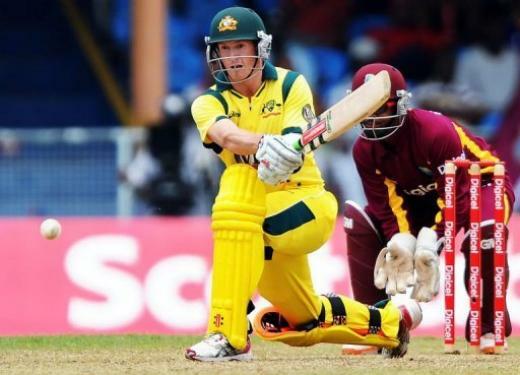 Australia 204-8 (George Bailey 48, David Warner 40, Dwayne Bravo 3-58) beat West Indies 140 all out (Marlon Samuels and Darren Sammy 35 each, Xavier Doherty 4-49) by 64 runs. The debutant George Bailey top scored with 48 and Xavier Doherty 4-49 scrapped West Indies by 64 runs in the first One Day International. Australia managed 204 runs for the loss of eight wickets in the allocated 50 overs and West Indies were bowled out for 140 in 32.2 overs. Bailey was declared ‘Player of the match’ for his match winning knock of 48 from 67 balls in the middle order. The first ODI of the five match series was played at Arnos Vale Ground, Kingstown, St Vincent on March 16, 2012. Earlier, Shane Watson won the toss, preferred to bat, went in with David Warner and started the innings in an attacking mode. Watson initiated the aggression by dispatching a four in the first over which was followed by three in the next as Warner was unexpectedly very calm. The stormy little innings of Watson came to an end on the first ball of the eighth over when he was declared leg before wicket for 21. The first wicket fell at 31 when Peter Forrest joined in with Warner as the latter came at his own while initiating the attack by sending the ball rolling over the boundary thrice in the ninth over. Forrest followed him in the blitz and the momentum was carried on until the added 60 runs for the second wicket. Warner was gone after scoring 40 off 55 with 5 fours as the wickets started tumbling and the Kangaroos had lost four for 99 runs in 26.3 overs. Bailey came in for his maiden ODI encounter and carried on the repair work with odd boundaries. The wickets were on the slide at the other end as Bailey kept on consolidating and became the seventh victim after posting 48 off 67 with 5 fours. 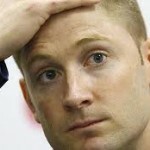 The Aussies scored 204 runs after losing eight wickets at the end of the 50th over. Dwayne Bravo was the main striker with three wickets, Kemar Roach and Marlon Samuels held two each as Sunil Narine claimed one. West Indies had a horrible start by losing their top three wickets for just 33 runs in 11 overs. Marlon Samuels and Dwayne Bravo put their heads down as the latter dispatched two fours in the 12th over and sent the last ball of the 14th over flying over the ropes. The duo opted for attack and the offense was continued as Samuels smashed three lofty sixes to Xavier Doherty in the 16th over. They contributed 64 runs for the fourth wicket before the Kangaroos bowlers brought their team back in the game. Bravo was bowled by Daniel Christian for 32 off 43 with one six and five fours as the score board displayed 97 runs. That was the beginning of the disaster for the home side as Samuels became the next victim without any addition in the total after scoring 35 off 58 with 3 sixes and 2 fours. The home side was reeling at 104 for the loss of nine wickets when the late assault by the skipper, Darren Sammy delayed the rival victory. Sammy was the last batsman who went back to the pavilion for 35 off 20 deliveries with 3 sixes and even fours as their innings was folded back for 140 with 17.4 overs to spare. Xavier Doherty was the main destroyer with four wickets, Clint Mckay and Christian shared two as Brett Lee chipped in with one wicket. Australia won the first ODI with a big margin of 64 runs comfortably and leads the five match series 1-0.